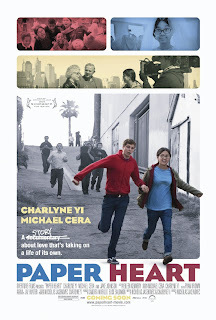 I didn't get the whole conception of Paper Heart (2009). I didn't know whether it was a documentary or a made up story, and I had to really watch it to find out. But even watching it, it felt like a story made up in a documentary style, but not as successfully as District 9. You see, Charlyne Yi, a 'musician and comedian', doesn't believe in love. She decides to travel across America to find out why people love each other. And maybe even find love. When she meets Michael Cera (yes, the very funny and awkward actor), will she believe in love? Charlyne Yi is not a musician, or a comedian. She can't sing and she's not funny. The reason why this movie was made is beyond me. Charlyne becomes so annoying in the end, because she is true to her word and doesn't believe in love. But we know this, and she just keeps going on and on and on. It really does become annoying and you get sick and tired of her. The movie is awkward, and unfortunately has few laughs to support it's self. The little puppet shows in it are a little random, but span most of the films originality. Is it a documentary? Yes, that's its format, but it is unclear whether this is a made up story or true. And I hear Charlyne Yi and Michael Cera have broken up.